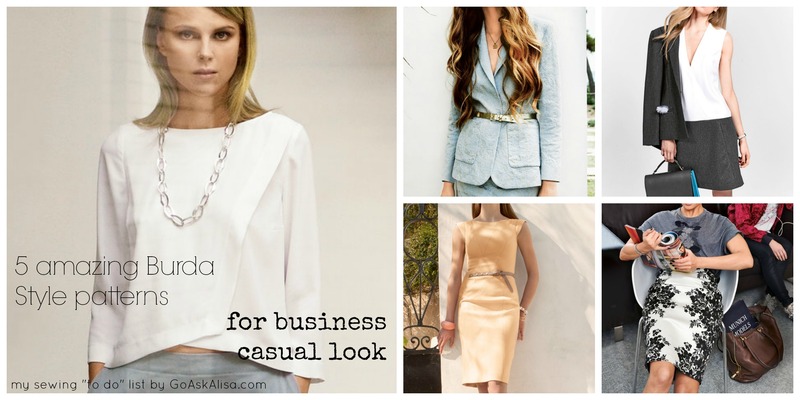 My Sewing “to do” list – 5 perfect Burda Style patterns for Business casual look – Go ask Alisa – DIY capsule wardrobe one stitch at a time! As I mentioned earlier – I am all in for sewing business casual. Surprisingly, there are some great ideas out there about how to make boring office life brighter with simple, yet fun and sophisticated style ideas. I am not sure yet if I am ready to experiment with bright colors and how business appropriate that would be, but I got as far as experimenting with textures and prints. Wrap blouse – amazingly simple, yet very very sophisticated and can be presented in different variations. You can play around by combining colors, black and white, layering them on top of each other. Use decorative stitch to make it even more interesting. Seamed shift dress – this dress looks like a complicated puzzle and I just love it. No need for printed fabric, decorative seams will do their job! Color-blocked dress – love the simplicity and how essential it is. You could dress it up or down, so it is definitely a must have! I am thinking to have different color choice. How about blush pink and dark beige? Pencil skirt – this pattern is the most essential pattern for a pencil skirt that fits great. You can use different fabric, combine sheer fabric with colored lining and much more. Jacket with pockets – what caught my eye at first was the fabric that they used – so pristine, so elegant. Then – pockets, I love having big pockets where I can put all necessary things and not carry them in my hands. I believe that this is a very nice design and I can not wait to try it out! So my deadline is by the Sept 30th – will see how it all goes. Either way – I am super excited to enrich my work wardrobe! Those are great styles especially the wrap blouse. That looks like it layers quite nicely in colder weather. Good luck with the deadline! I look forward to seeing your makes! Actually, I finished my Wrap Blouse yesterday so the post will go up today! Thank you so much for your feedback 🙂 and, I got your postcard request 🙂 ye! Next Next post: Sew it up: 1 skirt – 4 outfits!